Inside: Learn the best, most effective tips for getting your child to listen using positive parenting skills that contribute to your child’s emotional health. My 8-year-old daughter sits at the kitchen counter slowly relishing the last bits of her third piece of toast. As I momentarily ponder how someone so small can consume so much toast, I glance up at the clock to see that once again the morning minutes have escaped us. I alert my daughters that it’s time to go to school, prompting them to please pack-up their backpacks and get their jackets on. The first daughter continues taking tiny bites of crustless toast. The second child runs towards the piano deciding that right now is the time she’d like to practice her piano lesson. Transitions are hard, and they can sometimes be hard for kids too (haha). I begin explaining that really, we can’t make our child listen. I continue on to explain that not listening at times, is actually a healthy expression of individuality and that children are no exception to the rule of being allowed a free will. As much as we’d like to control our child at times, no human being can fully control another, and when control is our main goal as parents, it comes at the expense of our child learning self-sufficiency as well as leading to unhealthy relational outcomes. At this point, parents’ wheels are turning a bit, but I can see them patiently waiting for the good stuff, the practical real-life interventions that might make these tiny people cooperate more easily in everyday life. 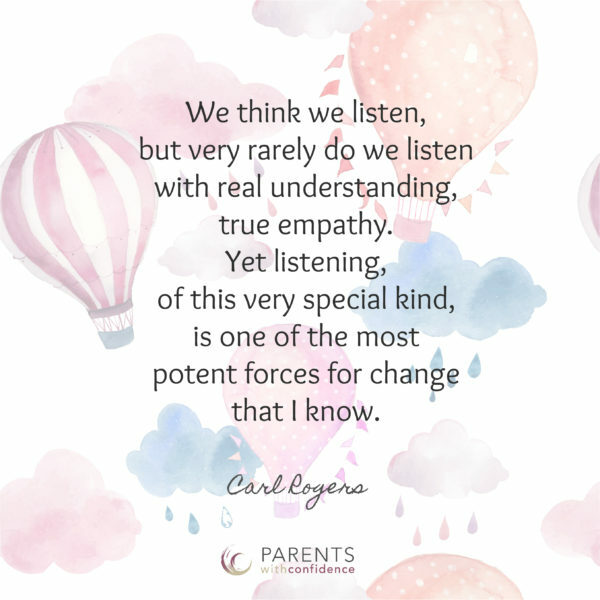 Sometimes we need our child to listen, right away. 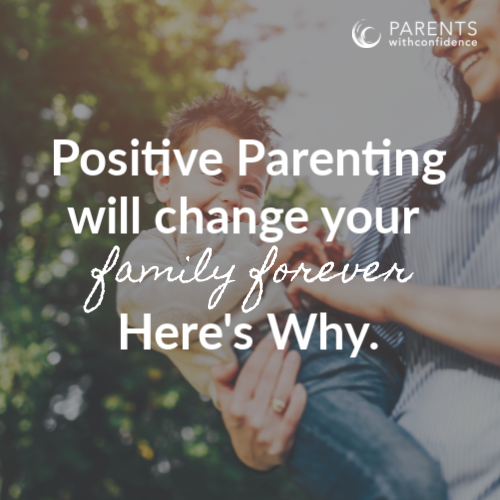 As many parents begin to navigate positive parenting skills in an effort to raise emotionally healthy kids, some areas are trickier to navigate than others, and responding respectfully during hectic transitions is one of them. 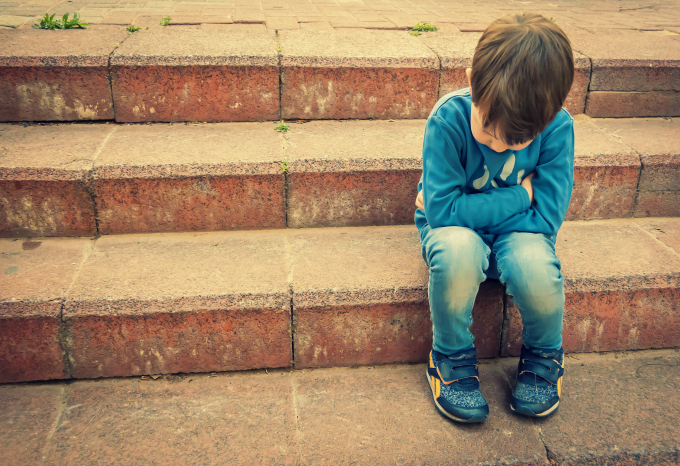 We do eventually have to get out of the house, so how do we inspire our child to listen without resorting to fear, threats and intimidation when those things do have the instant gratification of producing quick behavioral responses? First, we remind ourselves that while those things appear effective in the short-term, we aren’t parenting for the short-term. We’re aiming to raise internally driven kids who can navigate through the world on their own someday. Second, we can remember the positive parenting skills-based tools at our disposal which lay a much stronger foundation for our child’s future. Let’s talk about five habits that when done regularly, inspire better listening. If we’re being honest some days our poor kids are being herded around like a sack of potatoes, given little consideration of their opinions or agency over their agenda. Unfortunately, we also still live in a world that often views children as ‘less than’ forgetting that in fact, they are human beings just like us with wants, needs, and viewpoints. What if we pressed pause on our agenda for just ONE moment to listen to our child, hear them out, and think about what they might be experiencing at that moment? Often, just the simple act of listening with EMPATHY is enough to make someone feel seen, heard and validated as a human being…which then frees them up to more easily go along with the agenda. No matter what your child’s primary language is, their second language is play. Watch power struggles melt away when you take a moment to infuse fun, creativity, and imagination into daily routines. When we feel stuck with our child, play will likely be the fastest way to support forward momentum. After all who wants to put on an itchy boring old winter hat instead of a superhero protection helmet before getting into the ‘racecar’ (minivans are close to racecars, right?)? 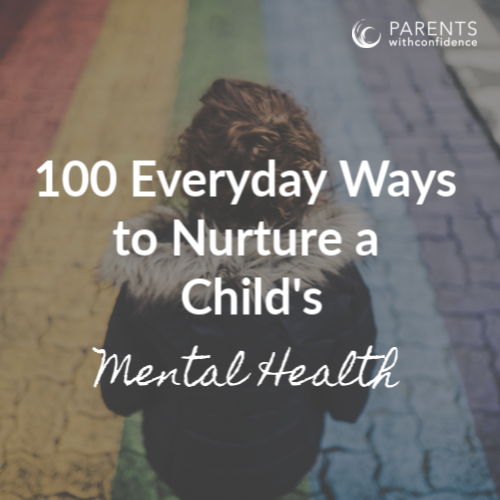 Having a background in child development, I’d be remiss if I didn’t talk to you about the importance of making sure your child’s primary need for connection is met, before expecting them to be fully open to your influence in the hectic moments of the day. Our kids’ minds and bodies can easily become overwhelmed with the hustle of hectic family schedules. If we desire to have them go with the flow when time is tight and we’re running out the door, we need to balance that out with plenty of time to slow down and connect. With all the sights, sounds and movements present during a busy transition a child may become overwhelmed and struggle to process the auditory input from adults. Increase the odds of being heard and listened to by keeping commands simple and clear. Use simple and concise working, and offer choices when possible. Instead of, “I’ve asked you three times to get your shoes on, do you want to be late for school again, now go into the laundry room and get them on now!“, a simple “shoes” (and then repeat as necessary) will do. If we see our child struggling with something, why not team up to confront the challenge together? It’s easy to become adversarial with our kids, forgetting that we are all on the same team and that everyone is likely doing their best at this very moment. It does take an extra moment up front but will save many more moments in the end. The fast fix usually isn’t the best way. Could we nag, lecture and yell at our child in order to force them off the piano or to set down their breakfast and run? Absolutely. On the days we do find ourselves stuck in old patterns, the furrowed brows, dejected looks and the general feeling of frustration and negativity that we receive from our child (not to mention the guilt we feel), are good signs that in the end, taking a step in a new direction is ever so worth the effort. When we practice the positive parenting skills of empathy, connection, and collaboration our child will be more apt to consistently follow through with our directives during busy days. 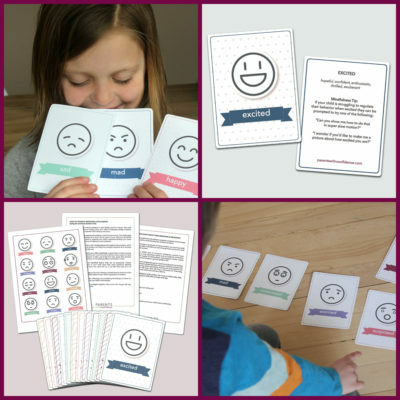 Not only will you be getting them off to school with less yelling and less guilt, you’ll also be teaching and modeling important skills they will use for life. P.S. Ready for a happier family? 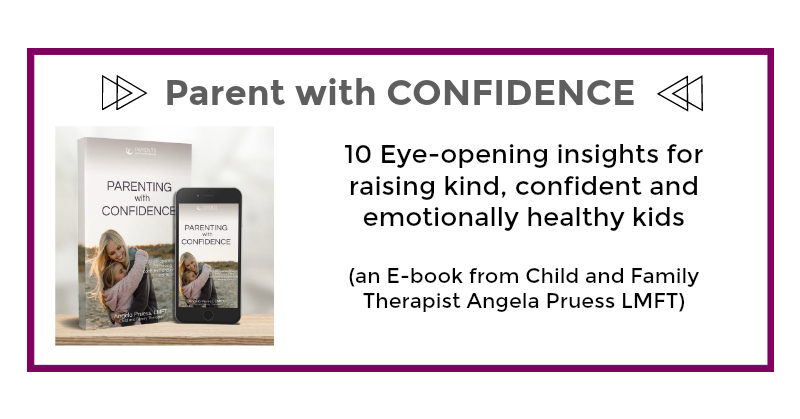 Learn a child therapist’s tips on promoting cooperation, trust, and strong family bonds without damaging your child’s emotional health in my new ebook Parenting with Confidence! Hi great read ;would love to receive any daily tips /reminders to be a calmer mother. Too raise strong emotional healthy children. Thank you so much for a great article. I am sharing this with my husband. We try positive reinforcement as much as possible with our very (and when I say very I mean very! Ha) active 2 year old. He can be fresh especially when tired, as most toddlers. I receive a bit of criticism from some (mostly from elders) that we need to be more stern, more time outs, more discipline and so forth. I feel like if you take the time to communicate with him and redirect him he does so much better. Thank you for this article, it truly is encouraging. Do you have an e-mail blast with tips and advice? If so, I’d love to be on the mailing list. Happy to have you following! !